The responsibility of a nightclub bouncer is an onerous thing, what if you let in the wrong people -- wrong people like the Butabi brothers. 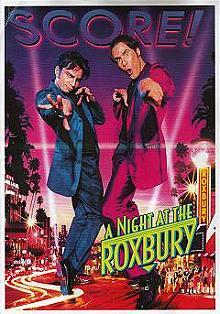 A Night at the Roxbury is another of the Saturday Night Live spinoffs. The Roxbury guys, a popular act, is a demonstration of hopeless pick-up strategy huddles and relentless come-ons always drowned out by the music. In bringing this to the big screen, and feature length, the writer had to introduce dialogue -- and giving a voice to two such inane losers who have nothing to say does not work. Writer Steve Koren describes the two brothers, "One thinks he's smart, the other thinks he's good looking, and they're both wrong." Their idol is one-time Booker and 21 Jump St cop Richard Grieco. Says Grieco of playing himself "I had already done all the research." The film makes fun of movies and post-it notes and more, but fails to ever find the insight that is behind a truly funny joke. Slide over Dumb and Dumber, here comes Lame and Lamer. jennifer Coolidge, Michael Duncan, Loni Anderson, Dan Hedaya, Meredith Scott Lynn, Molly Shannon, Lochlyn Munro, and Richard Grieco as himself.